From air testing to vintage car repairs, from prototype to finished product, there are no competitors in our field of manufacturing. There is a time when one needs to reconstitute a thread in a hole that has had its thread damaged either by dirt, over tightening or galling due to wrong screw or bolt being used. There are ways to overcome the helicoiling process which should be the last port of call. 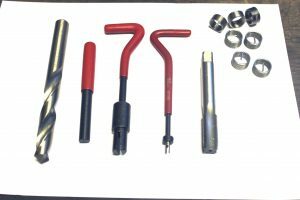 There are basically four tools used for the helicoiling, these are a drill bit, a tap and inserting tool, a pin for breaking off the little peg that drives the helicoil into the hole “this is called a basic kit”, there are more sophisticated kits. A lot of people buy a kit on eBay and do a poor repair. There are several things to be aware of; they are depth of hole, length of helicoil insert and the stress that the helicoil hole is going to take. It is said that a helicoil insert is stronger than the original aluminium thread. If we coil a 25mm deep hole with a 6mm long helicoil it will not take the stress of the original thread there are several lengths of helicoil available but standard helicoil kits come with standard lengths. As stated previously there are some tricks you can do to overcome helicoiling. Imagine you have a casing and its cover but several threaded holes have given up the ghost now If they were an original 3/16th whitworth you can assess the depth of the thread and choose a 5mm screw to fit into the full depth of hole after tapping. The cover will have clearance holes for 3/16th whitworth bolt or screw and this will be enough room for a 5mm too. 5/16th BSF hole can be tapped out to 8mm. I would only employ this practice on parts like primary chain-case covers, camshaft inspection covers, timing chain covers, essentially only normally loaded items that need the aid of a gasket or sealant to make a good seal. Screw threaded holes in engine parts are always made deeper than the threaded screw or bolt, so quite often a longer screw could be used to get good purchase on the existing part of the thread that has not been used. Most Japanese engines have bolts that are about 10mm shorter than the tapped hole that it screws into, so there are some very useful threads to use. Quite a lot of holes are partially tapped out and will tolerate being tapped out deeper without any drilling to make them deeper. If you want to drill holes deeper you will have to assess where the bottom of a tapped hole will come. If you select longer screws to employ an unused part of the thread at the bottom of a tapped hole you will have to be careful that there is no gasket goo in there as you will create a hydraulicing affect that can cause the tapped hole to break out and damage the casting or cover and such. Prior to helicoils there were other ways to create an insert, IE, a threaded hole was drilled out to a given size and a piece of threaded bar was screwed into the tapped hole and then this was drilled and tapped to replace the original thread. The problem with helicoiling is that the hole that has to be drilled to take the helicoil is rather on the big side and this can compromise the casting in certain situations to a disadvantageous way, hence I always use them as a last resort although it’s the easy way out, but not if they are badly fitted. Wassel 125cc Trials Antelope Low Fender. Copyright © 2017 Stotfold Engineering Company Limited. All rights reserved.